Developed in the ’70s, the classic Nike Bruin gets reissued for the holiday season. Harking back to the ancient days of sneaker history, the shoes are simple and clean-cut, featuring a premium vintage suede upper and a vulcanized rubber sole alongside the classic contrast swoosh. These classics are now available at CONCRETE. NIKE AIR MAX LIGHT VNTG QS IN-STORE NOW. Originally released in 1989, the Air Max Light never managed to emulate the success of the Max 1, and was eventually shelved in the lead up to release of the Max 90. Instead of casting the shoe into obscurity, this only served to make this hugely rare silhouette a true collector’s item, leading finally, to a re-release in 2007. This limited Quickstrike release sees the original colours reissued with vintage detailing as a tribute to this archive classic. Available now at CONCRETE. Nike has dropped two new colourways of their vintage Oregon Waffle for this summer, all classically done up in suede and nylon with vintage detailing and branding throughout. This is a quickstrike release, so don’t sleep on these or they’ll be gone, available now at Concrete. Nike Sportswear has just released the Nike Blazer Mid AB VNTG in three colorways! These kicks come in three colorways with White/Gorge Green, Gorge Green and Varsity Royal. Each of the shoes features a slightly vintage look with White soles and toe caps along with a Zipper on the inside ankle. These beauts are now available at Concrete. Due to popular demand, we have managed to get a restock of these beautiful vintage dunks. Come get them while they last, they won’t be showing up again at Concrete. 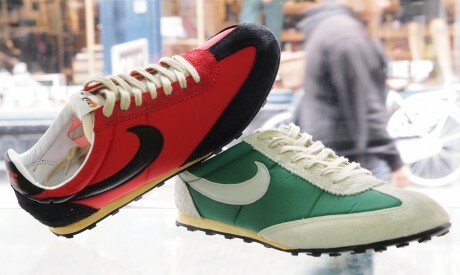 Nike’s famous V-Series runners return (a pack containing the Vortex, Vengeance and Venture, originally released in 1985) for SS11. The lightweight Vengeance was hugely popular due to the comfort and support it offered as well as the thoroughly modern styling. The Vengeance’s brilliant lines look just as good today and this classic silhouette is much loved by sneaker collectors across the world. After bringing back the Sky Force earlier this season, Nike dropped the sneaker in yet another colorway. The Sky Force 88 Vintage comes in white/varsity royal. As with all vintage sneakers by Nike, they added a bit of a worn in effect on the mid-sole.